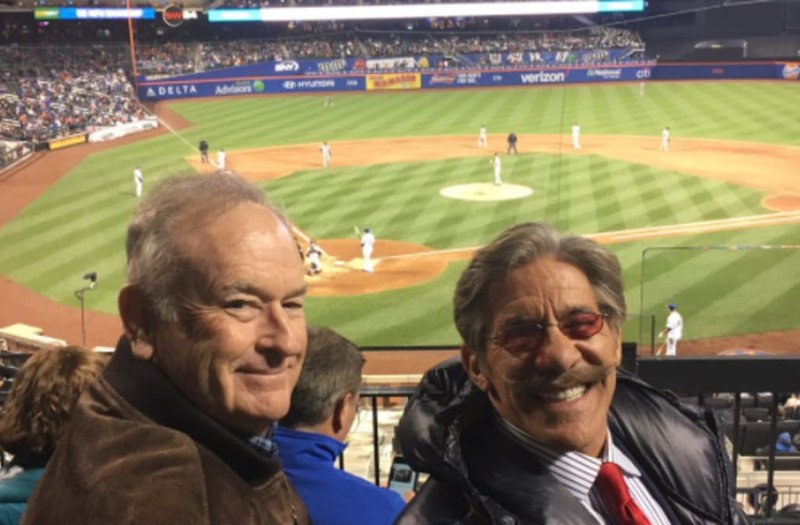 Current Fox News correspondent Geraldo Rivera attended a New York Mets game at Citi Field with the network's former star Bill O'Reilly on Monday night, and Rivera posted a photo to prove it. Last month, Fox News fired its top-rated host following a New York Times report that he and the network had paid out $13 million to five women who accused him of harassment or misconduct. Rivera was a frequent guest on "The O'Reilly Factor" and appeared on "Hannity" Monday night in a segment that aired after the tweet was sent. Rivera is famously loyal to his colleagues, and defended former Fox News CEO Roger Ailes when he was also accused of sexual harassment. However, Rivera eventually apologized for defending his now-former Fox News boss and said he was "filled with regret for stubbornly discounting" the various allegations of female Fox News staffers including Gretchen Carlson. "I am sad that I'm not on television anymore," O'Reilly said last month on his "No Spin News" podcast. "I was very surprised how it all turned out. I can't say a lot, because there's much stuff going on right now." "But I can tell you that I'm very confident the truth will come out, and when it does, I don't know if you're going to be surprised — but I think you're going to be shaken, as I am," O'Reilly went on to say. "There's a lot of stuff involved here." As for O'Reilly's personal life, he used to be spotted at Yankee Stadium with Donald Trump on a regular basis. It appears, at least for one night, that he's traded Trump and the Yankees for Rivera and the Mets.